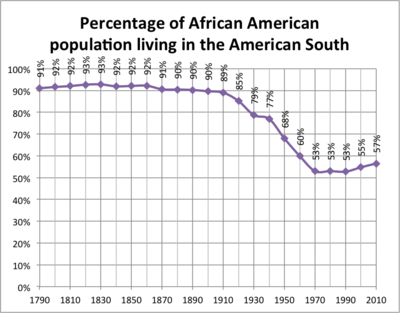 Graph showing the percentage of the African American population living in the American South, 1790-2010. The New Great Migration is the demographic change from 1965 to the present, which is a reversal of the previous 35-year trend of black migration within the United States. Since 1965, deindustrialization of cities in the Northeastern and Midwestern United States, growth of jobs in the "New South" with lower costs of living, family and kinship ties, and improving racial relations have all acted to attract African Americans to the Southern United States in substantial numbers. As early as 1975 to 1980, several southern states were net African-American migration gainers, while in 2014, African-American millennials moved in the highest numbers to Texas, Georgia, Florida, and North Carolina. African-American populations have continued to drop throughout much of the Northeast, especially from the state of New York and northern New Jersey, as they rise in the South. College graduates and middle-class migrants make up a major portion of the new migration. For instance, from 1965–2000, the states of Florida, Georgia, and Texas attracted the most black college graduates. The only state outside the former Confederacy that attracted a sizeable migration of black college graduates was Maryland, most of the population growth being in the counties surrounding Washington, D.C. In that same period, California was a net loser of black migration for the first time in three decades. While the migration is still in progress, much data is from this 35-year period. The New Great Migration is not evenly distributed throughout the South. As with the earlier Great Migration, the New Great Migration is primarily directed toward cities and large urban areas, such as Atlanta, Charlotte, Houston, Dallas, Raleigh, Tampa, San Antonio, Memphis, Nashville, Jacksonville, and so forth. Primary destinations are those states that have the most job opportunities, especially Georgia, North Carolina, Maryland, Virginia, Tennessee, Florida, and Texas. Other southern states, including Mississippi, Louisiana, South Carolina, Alabama, and Arkansas, have seen little net growth in the African American population from return migration. ^ William H. Frey (May 2004). "The New Great Migration: Black Americans' Return to the South, 1965-to the present". Brookings Institution. brookings.edu. Retrieved July 10, 2017. This page was last edited on 20 September 2018, at 03:22 (UTC).